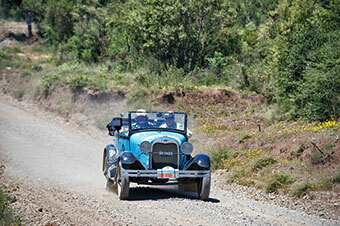 An epic 6,000 kilometre adventure drive from Buenos Aires to Cape Horn through Argentina and Chile. Today we left Santiago, the capital and largest city in Chile. Santiago is home to one third of the population of the country which by my reckoning makes for some 6m people and this morning they all seemed to be going our way. We were heading almost due South to Termas de Chillan which is 82km east of the larger town of Chillan but is a lot higher at 1650m. It’s a ski resort, a spa town and it sits on a Volcano. Chillan by the way was the birthplace of Bernardo O'Higgins the founder of modern Chile. He was born on August 20, 1778. He died on October 24, 1842 in Lima (Peru). For most of the morning we drove the Ruta 5 which is Chile's longest road and is part of the Panamerican Highway, a network of roads measuring about 48,000 kilometres and stretches almost continually from Alaska down to Cape Horn. Linking the Arctic with the Antarctic as it does it passes through many climates but as we drove our little section of the route there was a definite Mediterranean feel to the landscape, the agriculture and the climate with miles of vineyards and acres of fruit trees stretching as far as the eye could see. The oenophiles certainly had plenty to look at and think about today and you could almost hear them smacking their lips as we passed through Curicó which has both red and white wine varieties but is most widely known for its Chardonnay. Gradually the snow capped volcanic peaks grew larger and with them came the promise of an excursion onto smaller gravel roads with three time controls and a medal section within 15km. Drivers and navigators had to be alert to ensure they didn’t either incur a penalty or get lost between the villages of Digua and Remulcao and this section of the day was played out against the most stunning of backdrops. 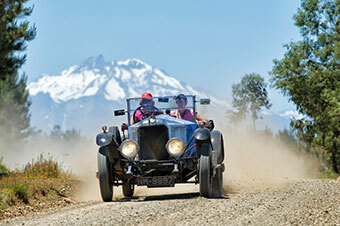 Gravel roads unfortunately do take their toll on the cars and Arthur and Anna Manners needed the engine mounting bolts and a loose sump guard seeing to on their Oldsmobile while Ross Lilleker and David Cooley in one of the Ford Model A’s suffered a puncture. The climb to the finish was a long one and a tough one mixing gravel, tarmac and a lot of road under repair with sharp hairpins and narrow wooden bridges. Avalanche warnings and earth movers dotted the landscape as we bumped up towards the hotel car park where we saw just what sort of problems the day had thrown up. Luc Janssens and Alfredo Uboldi’s Ford pickup was sitting at a strange angle with broken suspension. The red Chevrolet of Bill Dolsen and Joe Farina was up on axle stands having major front suspension surgery. The blue Chevrolet of Danny and Michael Day was waiting for someone to polish out the scratches. Others however were more lucky. Gerard Besson set to valeting his Citroen with a bucket and cloth while Michael Maedel was seen vacuum cleaning his Jaguar.